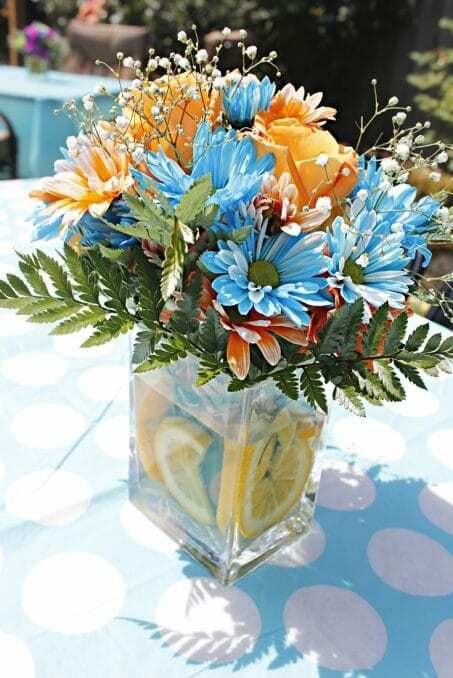 Host a beautiful backyard bridal shower full of lots of DIY ideas, decorations, finger food recipes, and fun game ideas. Three years ago my best friend since kindergarten and college roommate was finally engaged. Now, her and her fiance don’t do life the ordinary way though. 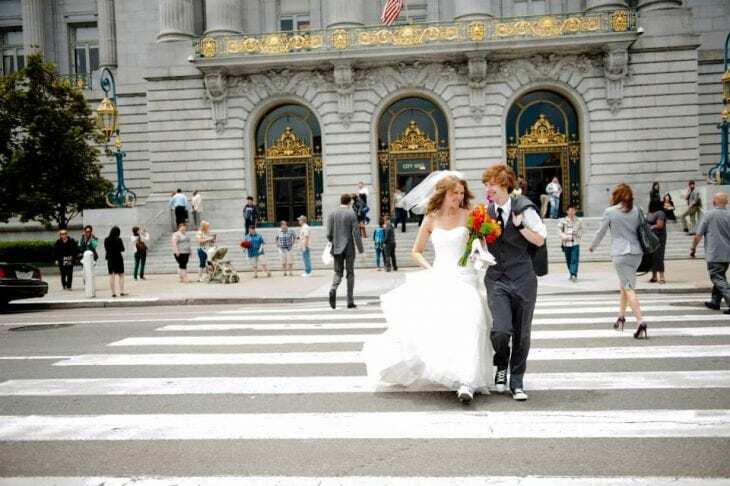 Rather than a wedding, they did a planned elopement and said no one was allowed to come to the wedding. Boo! Three years later and I’m still bitter. Anyways, since we didn’t get to celebrate with them at a wedding we decided her bridal shower would be the big bash so we could spoil her. I came across these pictures a few months ago and realized I just had to share it since I wasn’t blogging much at the time. Here’s how it all went down. We kept the food simple making it easy to eat and mingle. 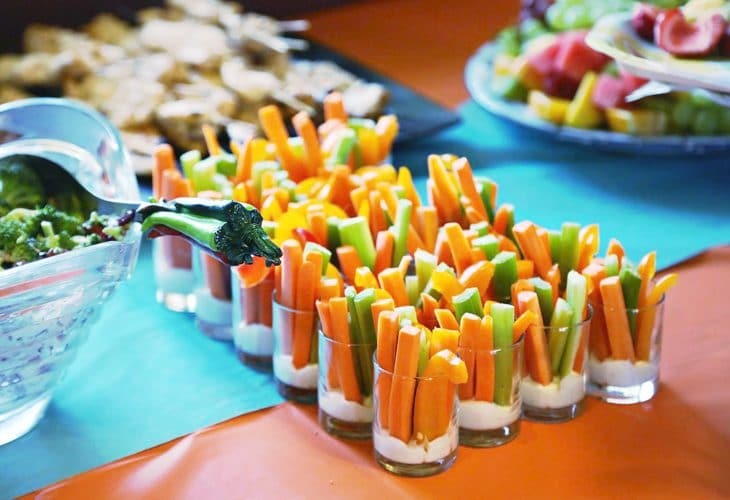 These vegetable sticks served with ranch in shot glasses are the perfect finger food for a party. We love them so much we even did them at our graduation party. Chocolate Mousse layered with Toffee Candy Pieces and Brownie Crumbles <<< These are seriously amazing!! These heart cookie cutters were great for cutting the brownies and I even made some cute heart shaped rice krispy treats with the leftovers from the rice krispy balls. 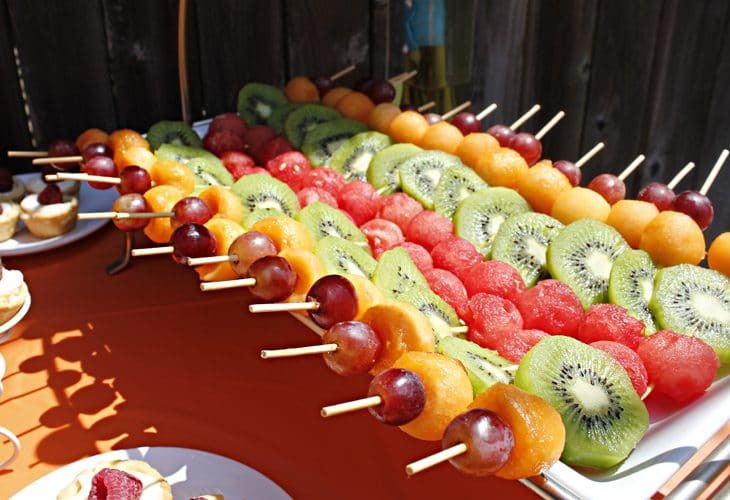 The fruit skewers are also a must-have when you’re thinking finger foods. So simple and easy to snack on as we play games and hangout. 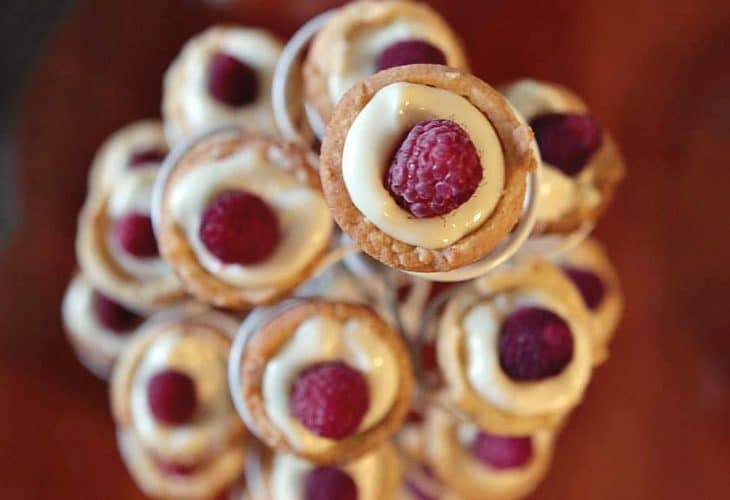 These lemon tartlets….oh my yummm! Seriously, so good! 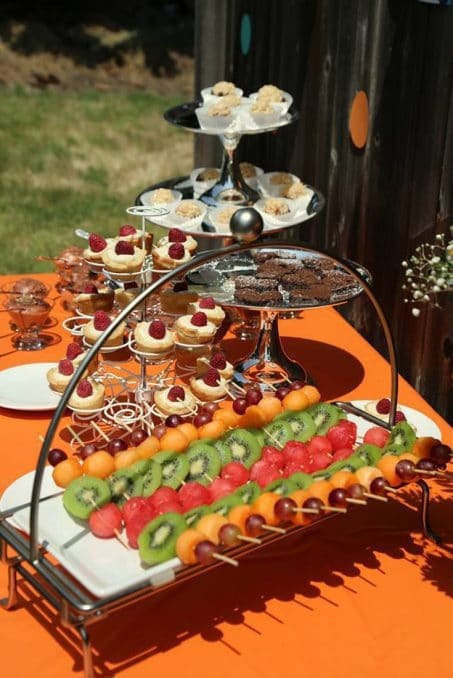 You can add different slices of fruit on top depending on the party theme. We did raspberries for this bridal shower. 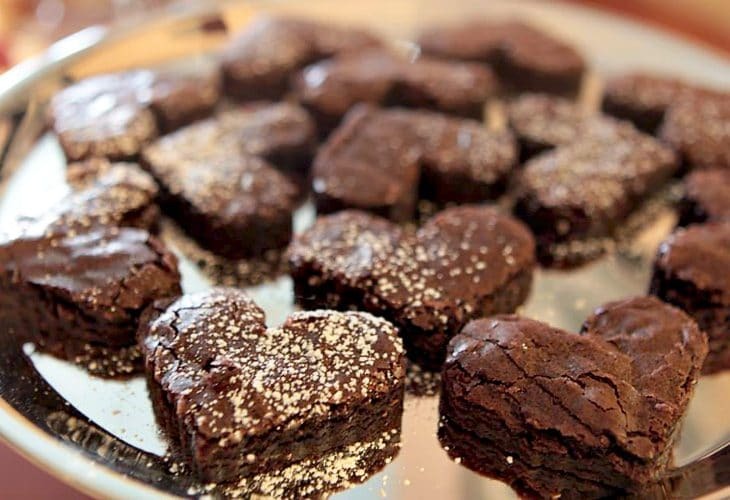 You could also do a small kiwi slice, strawberry, or a blueberry for different parties. 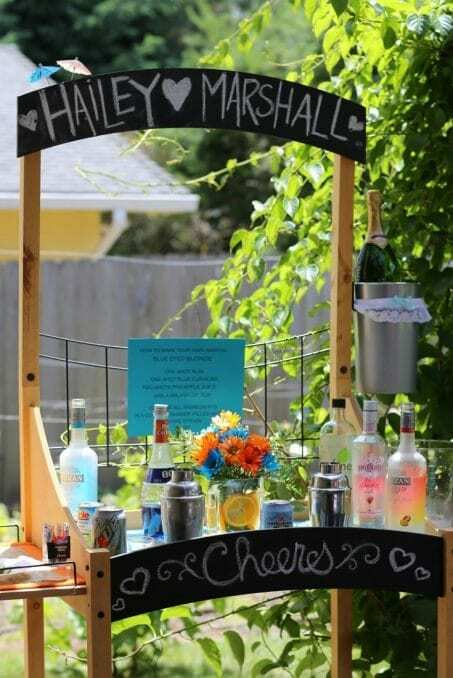 For the drinks we served lemonade along with a self-serve bar. The bar included a recipe for the Blue Eyed Blondie, named after the bride-to-be. When guests walked in they were welcomed by the game table. Here we had a pile of white and blue necklaces. 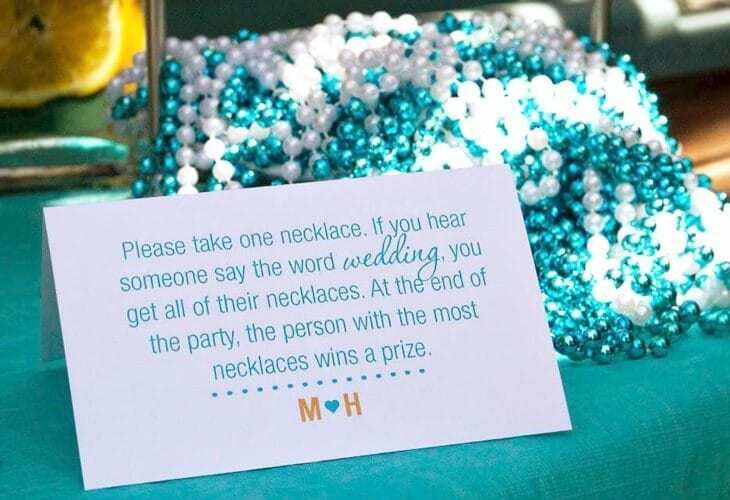 Guests were asked to put one necklace on and if anyone said the word “wedding” than the person that heard it got the necklaces from that person. The person with the most necklaces at the end of the party got a prize. 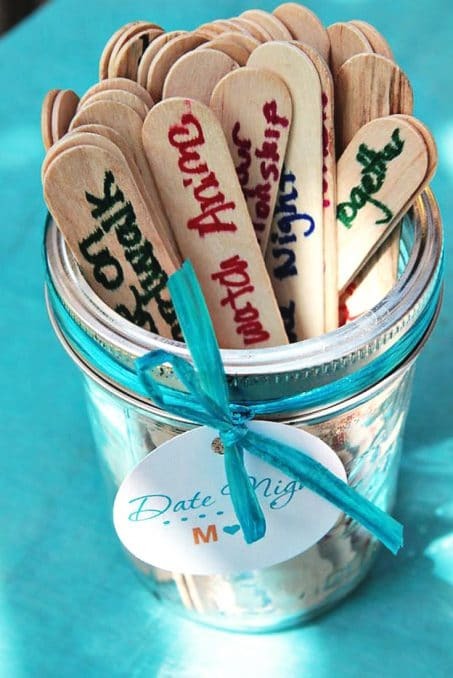 What couple ever feels like they have enough date night ideas tucked in their back pocket? 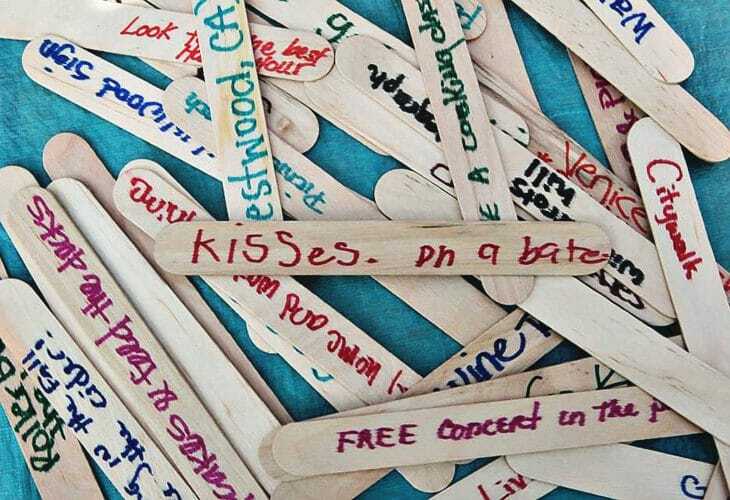 We had popsicle sticks available and asked guests to write date night ideas on the popsicle sticks for the happy couple. And my favorite game! 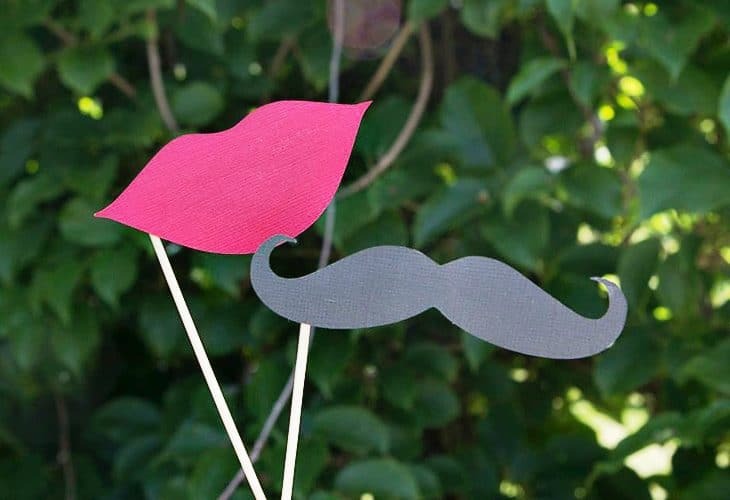 I cut lips and mustaches out of cardstock with my Silhouette Cameo and then hot glued them to skewers. 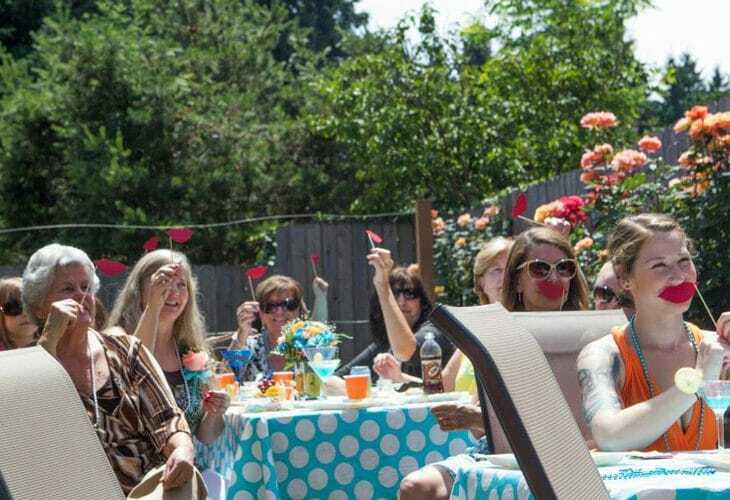 When guests arrived we asked everyone to take a lips and a mustache skewer. Before the party I asked both the bride and groom the same questions separately. 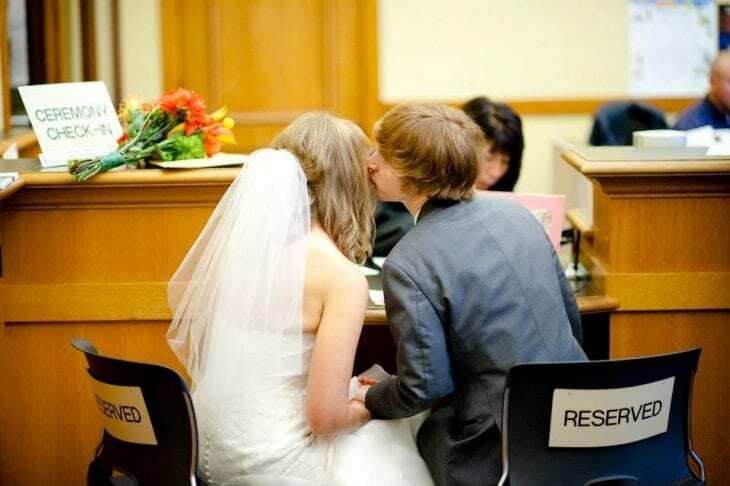 The bride had not heard her fiance’s answers until that day. Describe how you two met. What was the moment you realized you wanted to get married? What is your favorite thing about your mate? Where is one place you would like to travel to together? What is the most fun thing you two have done together? I’m most looking forward to….about the wedding. I’m most looking forward to…about the honeymoon. I then read one answer from their responses and the guests had to choose whether the bride or groom said it. It was such a fun game and helped us learn a little bit more about their past and future plans. The guest who guessed the most right got a prize. Another fun thing we did was this giant polaroid frame! I cut out this shape into a piece of white poster board I picked up at the dollar store and then you can customize it to say whatever the event it. My handwriting certainly could have used an improvement, but oh well. It still turned out cute! 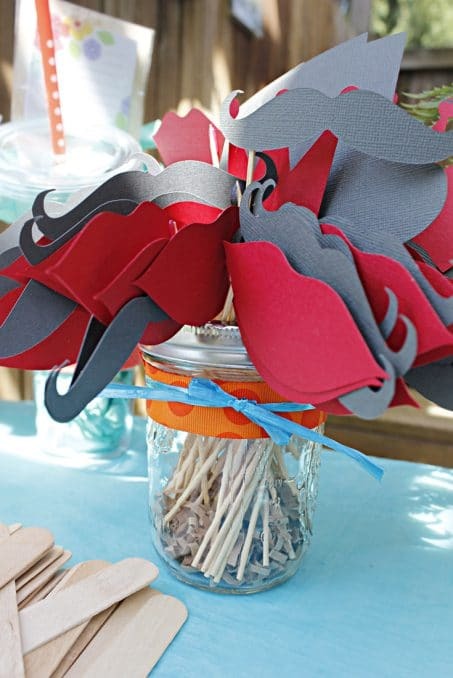 I cut out more shapes, hot-glued them to skewers, and had them waiting nearby for guests to take pictures with. I love how it turned out and helped document the day! Love these ladies and can’t believe we’ve been friends for over 20 years!! I feel so old! 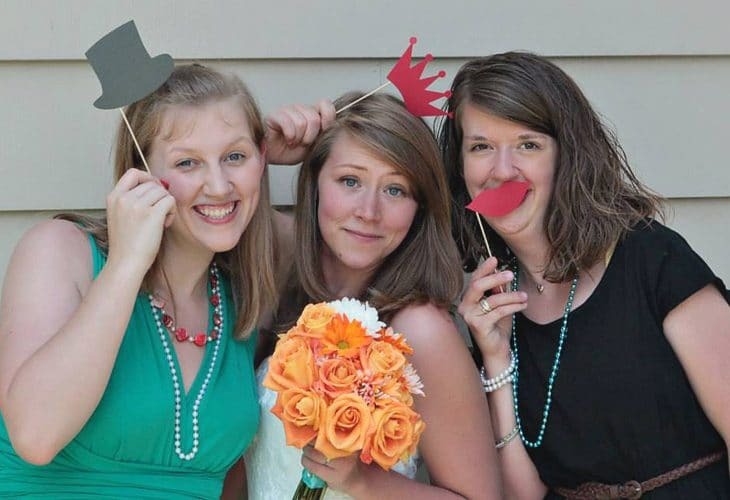 The one on the right, after dating for 7 years, is finally getting married this weekend! I can’t wait!! Ok guys. I just have to include some of the photos from their wedding because they are seriously stunning! 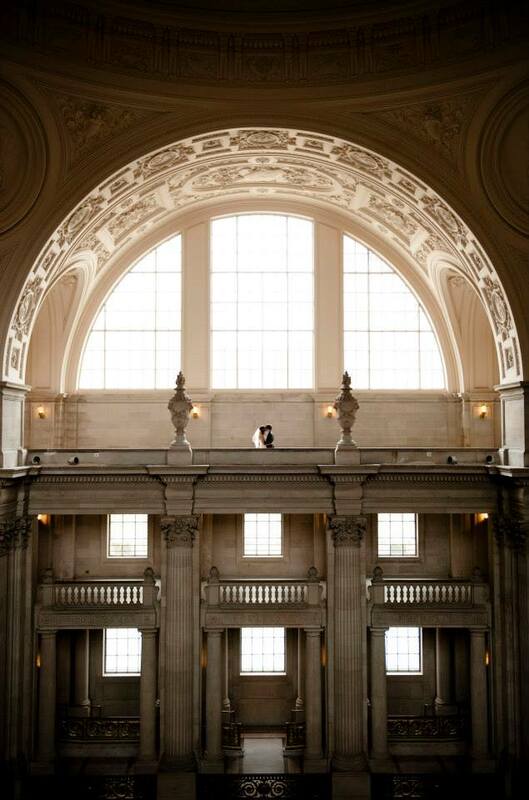 They lived in LA at the time so ran away to San Francisco to City Hall to get married. They didn’t want a big wedding but they did want to document the day. 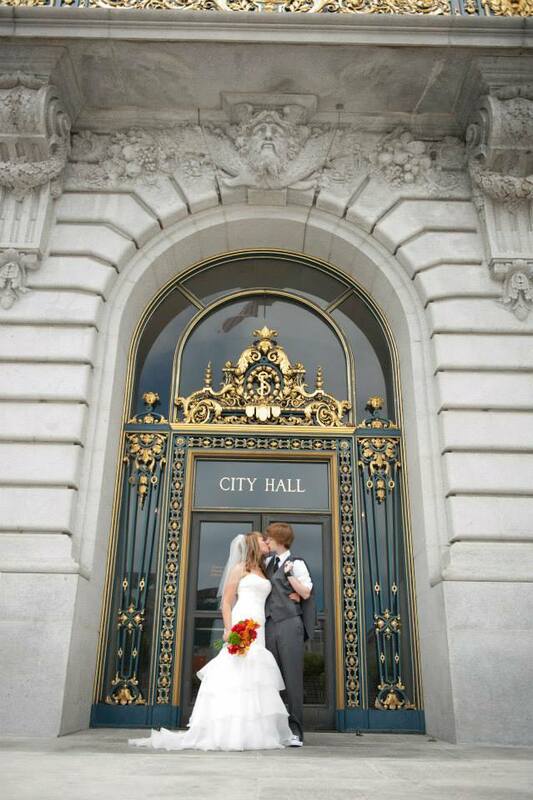 I love how beautiful this day was (even thought I didn’t get to be there) and the city hall is seriously gorgeous!! And this picture is just so fun running away from city hall. Happy anniversary, friend! Can’t believe this was already three years ago. 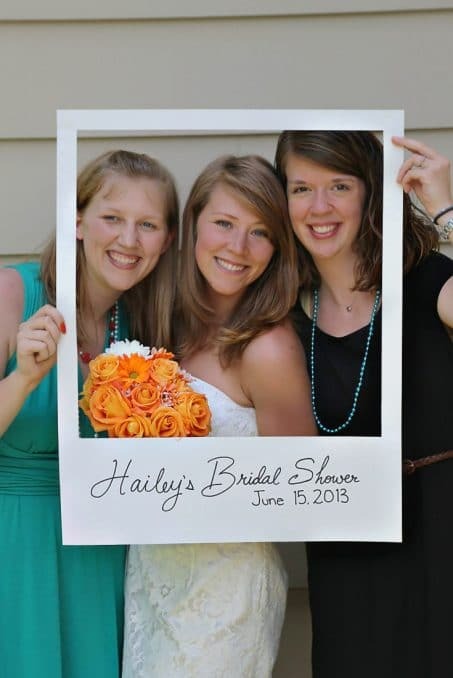 What do you think of this bridal shower? I’d love for you to share it with your friends using the share links below! I love all these ideas, especially the photo booth Polaroid frame. How cute!!! Me too! It was so fun! Thanks, Catherine!